This adorable fish is fun to make and even more fun to play with! Learning Outcomes: Exercise fine motor skills. Create a 3D pal for dramatic play. Start with a sheet of marble paper, white side up. Fold it diagonally, and trim off the excess. When you unfold the sheet, you should have a square. Still with the white side up, turn the sheet so it looks like a diamond, and the fold line is vertical. Next, fold the left and right points of the diamond in, until you have an inverted kite shape. Trim the shorter point so it is rounded. Next, unfold the two sides. Fold your paper in half along the original fold line, and carefully cut a series of slits from the point to about 2″ before the curve. Your cuts should only be as deep as your second set of fold lines. Overlap the two outside triangle and tape them securely to create the 3D body of your fish. You should have a triangular prism. 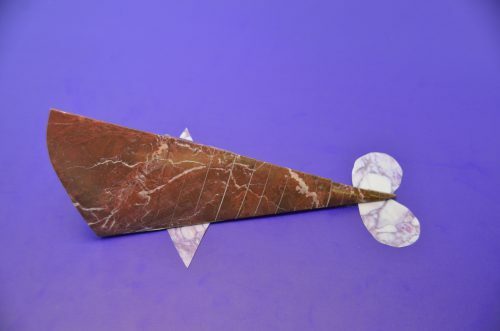 Choose another sheet of marble paper, preferably in a contrasting pattern from the body of your fish. Fold the sheet so you have approximately 2″ of paper below the fold. Draw shapes for fins and a tail for your fish. I drew triangles for the fins, and rounded shapes for the tail, and then cut them out on the fold. You’ll need to cut the fins apart, but leave the tail as one piece. Tape the fins and tail to the underside of your fish. To give your fish some personality, add eyes and a tongue! I used the blue marble paper for the eyes, and the pink paper for the tongue. Tape the tongue inside your fish’s mouth, and the eyes to his head in front of the slits. Now your fish is ready to swim! Crown yourself with a simple origami craft that the Greek statues would be proud to wear! Learning Outcomes: Exercise fine motor skills as you fold and construct this crafty crown. Create costume pieces for dramatic play. Start with a single sheet of marble sculpture paper. To complete this crown you will need 3-4 sheets of paper, depending on the size of your head but I want to start by walking you through the basic component. Start by folding the sheet diagonally, and cut off the excess. Unfold the triangle; you should have a square sheet. Fold the square sheet in half, then open it, and place the white side up on the table. Fold the top two corners to meet at the center fold line. Your sheet should have a point at one end. Fold the square bottom up to meet the bottom of the arrows. Crease firmly. Fold the folded rectangle up, and flip the whole sheet over. You should have a triangle with flaps sticking out from behind on either side. Pleat the triangle by folding it down, then folding it up approximately 1/2″ above your first fold. Repeat 1-2 times to create the graduated steps that serve as decorations. Repeat steps 1-4 three more times, until you have four components. Choose one component. Lay it on the table in front of you with the triangle’s point facing away from you. Open the component so you can see the white inside. Slide the squared edge of another component onto the white area, overlapping the two pieces by 1-2″. Fold the rear flap and triangle over top of the second component. Carefully slide a third component into the second component, repeating steps 6-7. Be careful not to pull the second component out of the first component. Add the fourth component into the third component. Now it’s time to finish the loop and make your crown wearable. Using steps 6-7 again, place the free end of the first component inside the free end of the fourth component. Now you should have a “seamless” loop. The components can slide in and out of each other, so you can make small adjustments for individual head sizes. For adults, you may need to add a fifth component. Very young children may only need three components. The middle of winter can feel long and dreary, so lighten up the atmosphere by creating art tiles! These tiles can be used to create a beautiful bulletin board, classroom door or hallway display. Alternatively, they make a simple but beautiful piece of take-home art. Learning Outcomes: Explore colors and textures. Mosaic abstract shapes together. Practice fine motor skills. Start this activity with a sheet of Marble Sculpture Paper. If this is a take-home activity, kids can cut their tiles to whatever size and shape they want. If you plan to use this for a classroom art piece however, it’s easier if all the tiles are the same size. Scraps of the paper can be effectively used as corner frames (like in the yellow tile) if desired. We suggest using a paint tray in the center of a group table to keep the crafty leaves from flying everywhere. Older students can pop out the die cut leaves on their own. For young students, you may want to pop the pieces out beforehand and let the kids choose and glue them. Using a glue stick, glue the leaves onto the tiles. Kids can choose to make abstract patterns with their leaves like we did, or they might want to create animals. You can choose a theme for everyone to adhere to, or let the artistic moment dictate decisions. Once students have completed their tiles, they can either take their artwork home, or it can be used to create a spectacular hallway or bulletin board mosaic!